Up on old man TJ’s roof where he keeps three hives in Albuquerque, I began my education. This here’s a keen picture (TJ frequently peppers his speech with the word “keen”) illustrating the difference between brood and honey. 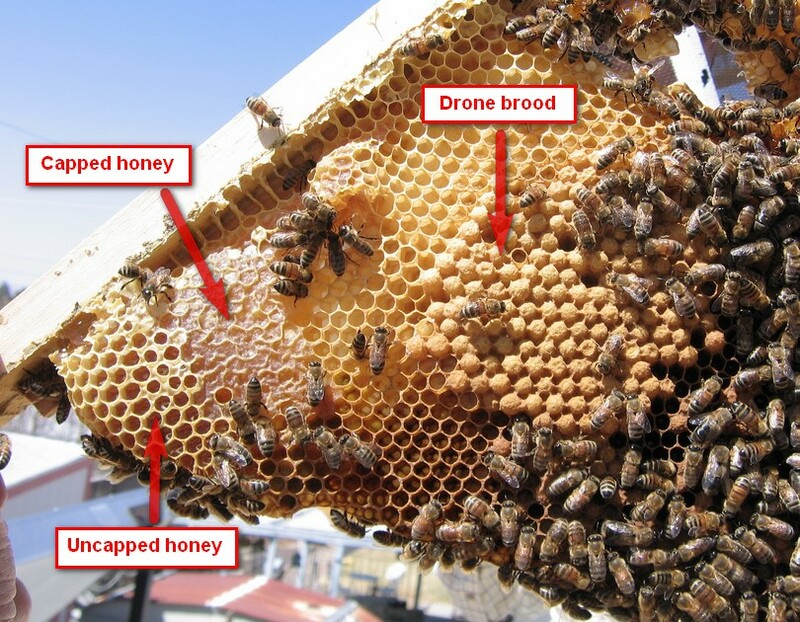 Drone brood pops up out the comb to accommodate the larger size of drone larvae. Later this week, I’ll post an annotated photo of worker brood so that you can see the difference. Drone brood is fine. You want some drone brood in your hive, but too much and you won’t have enough workers to gather honey and maintain the hive. Too much drone brood might also be a sign that your queen is failing. Thank you from a first-year bee hobbiest. I was trying to figure out the difference in honey and brood comb and your photo truly helped.